Looking for a unique building and stacking toy with endless possibilities? Then look no further. Dado Cubes are a clever variation on the classic stacking toy. They combine art and science as your children explore architectural principles. Each time they play with them, it is a lesson in proportion, balance, structure, organization, and color. 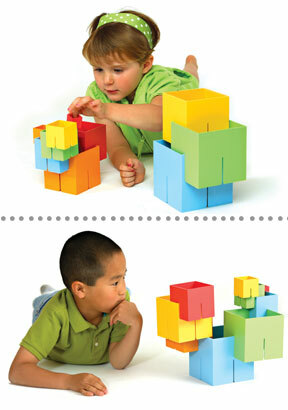 These blocks will engage your child's imagination due to the limitless design possibilities. They can stack and interlock the slits on the cubes to create an unlimited number of three-dimensional structures. The ability to use them horizontally, vertically or nested together allows children to exercise problem solving skills, hand eye coordination and spatial development. Each set includes ten different pieces, that easily nest for storage, and range in size from one inch to five inches. This is enough to build structures higher than 32 inches. Made in USA. Dado Cubes are incredibly valuable for your child's development. They are beneficial and fun at the same time. It is an amazing construction and building toy that helps develop fine motor skills and promote problem solving skills. These essential abilities form the bedrock skill set of future architects, designers and engineers. They help children improve fine motor skills, including hand strength, finger dexterity and coordination of small muscle movements. With mastery of the movements required to fit the cubes together, children take obvious pride in their creative constructions. Psychosocially, children develop skills as they share ideas and talk about their play goal. Their unique groove-connecting assembly, and the challenge of achieving the highly desired perfect balance draw children in. Visual Spatial Learning has captured the attention of scientists and educators as being highly valuable in child development. It is the ability to mentally picture things and is characterized by the ability to appreciate patterns & form in very large or small areas of space. Children with profuse Visual Spatial Intelligence can construct three-dimensional mental images and visualize them from multiple perspectives. A keen eye for form, design, color, size, shape and space enables these gifted children to create realistic representations of real world images. This wonderful toy may help them to expand their understanding of dimensionality, viewing their world from a unique perspective! Each set includes ten cubes in a multitude of colors. They are made in America using superior materials and craftsmanship, and are loaded with educational benefits. A single Dado Cube set is enough to build an endless number of structures. Order Yours Today! Dimensions (l x w) 1" x 1" - 5" x 5"
Dado Cubes - Discover hours of stacking and building fun. Your kids won't want to put them down. Dado Cubes are a favorite of boys and girls alike. Bright colors and endless possibilities make them perfect for all ages. Order Yours Today! I plan on adding to it. My two-year-old grandson immediately was enthralled by the Dado Cubes Set and now, three-weeks later, still uses the set in creative different ways. I plan on adding to it. Get Specific Pieces To Expand Your Collection. 2-5 Pieces Per Package.